As talks between Washington and Pyongyang on denuclearisation appear to have stalled after last month’s summit between President Donald Trump and North Korean leader Kim Jong-un ended without agreement, South Korea is looking for ways to end the impasse. A statement issued by Seoul’s presidential Blue House on Monday said the time was now right for the two Koreas to hold further talks building upon President Moon Jae-in’s policy of rapprochement which saw him meet Kim three times last year. To end the impasse, South Korea wants to get the North to “agree with a broad road map aimed to achieve the overarching goal of denuclearisation,” according to the Blue House statement. Both sides subsequently took steps to defuse tensions by demolishing watchtowers near the demilitarised zone that separates them and starting work on cross-border railways and roads. 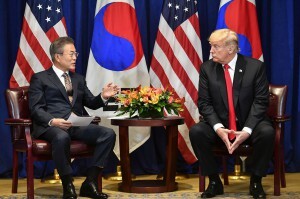 But without substantive progress in nuclear negotiations and on sanctions relief, these inter-Korean projects will likely go nowhere.Koh yu-hwan, a professor of political science at Dongguk University, said Seoul was trying to keep diplomacy alive “even if the prospect of the North and the US reaching a compromise in the foreseeable future does not look bright”. “Seoul’s idea is that the North and the US reach a compromise in which Pyongyang implements a complete denuclearisation phased in a couple of steps rather than at one stroke,” he said. In an interview on Sunday, National Security Adviser John Bolton criticised the North Korean side for not being “willing to do what they needed to do” to reach a deal, while also mooting the possibility of China being involved in future talks.”The idea that there’s a role for China in the negotiations is something that we’d be willing to consider if we could see some movement on North Korea’s part,” he said in the interview with New York radio station AM 970.